Furthermore, horses and the beautiful scenic vistas and view sheds that horse lands provide contribute greatly to our communities by enhancing our quality of life and increasing property values. However it is important to note that horses cannot provide these benefits without the land to support them. Increasingly, both horsemen and non-horsemen have witnessed open areas that were once horse lands taken over by development. According to the 2012 USDA Census from 2007 to 2012 the number of horse farms/ranches decreased by 14% (71,146) and the horse population decreased by 11% (407,479).ii Poorly planned, uncontrolled development or sprawl, population growth, and a citizenry that is increasingly unfamiliar with livestock are the greatest threats to equestrians and horse land owners today. While premier horse facilities, competition and recreational riding venues can exist close to and even in cities, local land use planning must purposefully incorporate them. By incorporating horses into the land use planning process and making communities equestrian-friendly, planning departments can encourage horse owners to remain in the area or possibly move to the area for the provided amenities, enabling the community to reap the economic, ecological, and social benefits that horses can provide while preventing conflicts with other land users. With these goals in mind, the following are seven steps that can be implemented to better incorporate horses into the land use and community plans. Know Your Equestrian Community. The shape of the local horse industry will determine what types of facilities are necessary. Understanding what types of equestrian uses are present in the area and where they are located is an essential knowledge base for future planning, but one that many communities are lacking. Horse owners are not a uniform body; the equine industry ranges in scale from the backyard horse owner to large show facilities and racetracks. In addition, horses are used for many purposes, ranging from companion animals to trail and endurance horses to show and race horses. For example, areas with large populations of recreational trail riders may have more need of well-maintained trail systems than areas with a high population of racehorses or gaited show horses. Develop and Maintain Equestrian-Friendly Trail Systems. 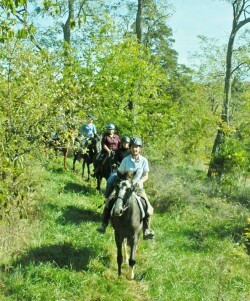 Recreational and trail riding are the most popular uses of horses in the U.S., with nearly 4 of the 9.2 million horses in the country used solely for this purpose.iii Therefore one of the most widely attractive amenities that can be provided to horse owners is a well maintained and horse-friendly trail system. 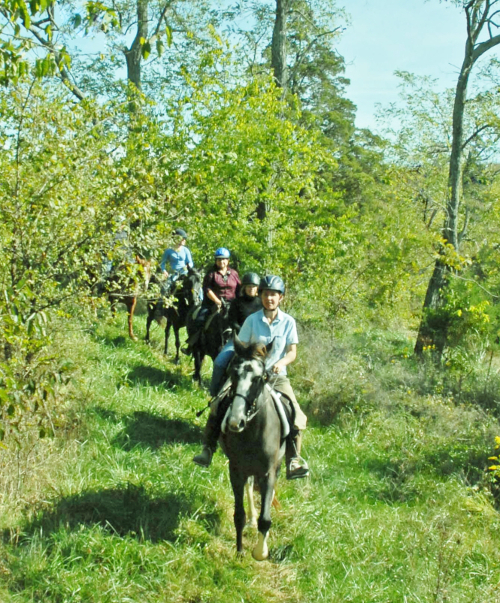 So, what makes a trail system equestrian friendly? First of all, there must be ample space to park and turn horse trailers around. A few stalls or paddocks may not be amiss in well-used areas, especially where camping is also a possibility, but as a minimum there must be water available at the trail head, and possibly along the trail as well, depending on its length. The trails themselves should be reasonably wide to allow for safe passage, and the footing should be natural, not gravel or pavement, to aid in traction and avoid bruising of the horses’ feet. When clearing overhead limbs from the trail, consider that a rider’s head is often eight feet or more from the ground, and clear the overhead space accordingly. Be sure trails are well-marked; pocket sized maps could be made available at the trailhead to complement marks along the route. Also, if trail systems are shared with other users, such as hikers with dogs or ATVs, be sure that rules for shared use of the trails are clearly posted and enforced. Maintenance of the trail system should include trimming of brush along the sides of the trail and occasional re-clearing of overhead branches. Footing should be maintained reasonably well, with washouts or other unsafe areas repaired, but the footing does not need to be maintained perfectly level in most cases. 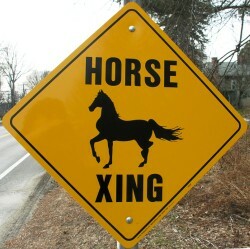 Create Equestrian Zones or Neighborhoods. One of the best ways to avoid complaints about odor, dust, and loose horses is to cluster the horse farms near each other. In addition to avoiding neighbor complaints, this allows for the easy development of trails and equestrian facilities within these communities. In areas where horses are a large part of the history or culture of the community, equestrian zones can also be used as tourist draws. 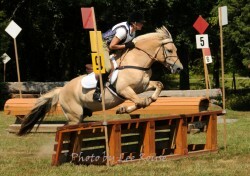 For example, an equestrian zone or neighborhood with a large population of young or competitive riders could be grouped around a county or city show facility, which could then provide the government with additional income. The Oklahoma City Fairgrounds, for example, hosts 15 major events each year that provide 17,000 full time jobs and $182 million dollars of income to the city and the surrounding community.iv The need for and type of facility will depend on the equestrian industry in the area, which is where knowing the shape of that community comes in handy! The tourism aspect of these zones can be increased through measures such as cohesive signage or fencing types that work to create a distinct district character; examples of such measures can be seen in areas like Wellington, Florida. Protect Agricultural Lands from Development. One of the most important resources for horsekeeping is land. On average, each horse requires 1 to 2 acres of pasture land, although that number varies depending on the region of the country and the style of management. The protection of open space and agricultural land, of which horse farms are usually considered a part, is therefore vital to the maintenance of an equestrian community. In addition to pasture, space is needed for trails and competition arenas. Several ways exist to help protect these open lands, ranging from Transfer of Development Rights (TDR) programs to zoning definitions. TDR programs are based on the amount of development allowed in the zoning code, with one zone designated as the sending zone, typically in a more rural area, which will remain more lightly developed than allowed, and a separate zone, usually in a more urban area, designated as a receiving zone and allowed to develop more densely, for example with five stories instead of three. Once the development rights are transferred from the sending zone, they are permanently revoked from the sending property, leaving the property rural in nature in perpetuity, at least in theory. Cluster Development is similar to TDR. Cluster development gathers the amount of development allowed into a smaller space than might otherwise be the case. The difference is that cluster development is usually implemented on large pieces of property in the hands of a single developer, while transfers generally occur between unrelated pieces of property. Cluster development allows a developer to develop a smaller piece of the property more densely in exchange for leaving the balance of the property as open space, usually used as a community park, garden, or similar function. This saves the developer money, since there is less footage of roads, sewers, etc. to be laid, and saves the open space for the community’s benefit. Urban Service Boundaries and Lot Size Restrictions are zoning-based means to protect the rural areas of the community. A hard urban service boundary, outside of which public sewer and water are not extended, can limit development outside of itself, encouraging the remainder of the land to remain largely rural while promoting denser infill development within the boundary, essentially encouraging a larger scale version of cluster development. Over time, the boundary is likely to expand, but use of such a boundary can help slow the sprawl of the urban and suburban land uses. Restricting lot sizes can also be a tool to maintain open space. While small farmette lot sizes, between 5 and 10 acres, can end up encouraging sprawl, forcing lots to be 40 acres or more, as Lexington-Fayette County does in its Core Agricultural Lands, can help maintain rural lands in agricultural uses. A community-wide greenspace plan, defining which areas will remain open, is also a vital step in protecting these areas. Without a clear picture of what should be left as open space, it is too easy for development to sprawl outwards from an urban area. Athens-Clarke County in Georgia, for example, has defined a green boundary at the edge of the county to prevent the spread of uninterrupted suburbia into neighboring counties. This is part of an effort at maintaining a distinct identity; the green belt is intended to indicate a separation between cities and counties beyond its value as open space. 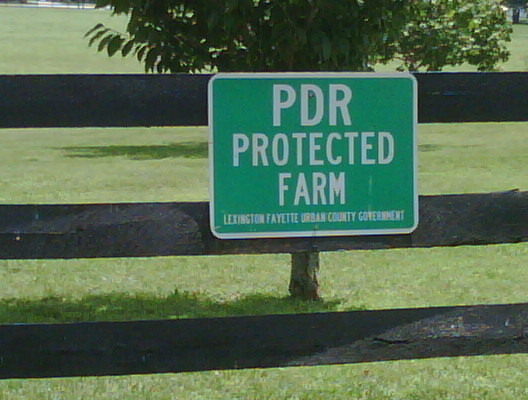 Other more nontraditional means of protecting open spaces can include scenic or historic overlays, particularly in areas such as Lexington, Kentucky that have a strong tradition of horsekeeping, and the issuance of conservation easements, which protect individual properties from development. These are usually managed by a third party such as a land trust, but can be managed by governments as well. In essence, the property owner gives up the right to develop the property in perpetuity; the easement is recorded with the deed, and the land under the conservation easement cannot be developed, even by future owners. 5. Develop Appropriate Codes and Ordinances. The utilization of appropriate codes can be beneficial to the development of an equestrian-friendly community, helping to prevent friction between neighbors, especially where equestrian uses interact with non-rural uses, and helping to ensure that the potential benefits of equestrian properties are realized. The history of zoning is that of preventing nuisance uses, those that annoy the neighbors, resulting in complaints to the city or lawsuits that are time and money consuming. Therefore, one of the best ways to prevent a land use is to subject it to unreasonable requirements under zoning codes or city and county ordinances. Beneficial ordinance on the other hand encourage the development of the desired industry and create space for it in the community. For the horse industry, regulations on the minimum lot size are reasonable, ensuring the provision of adequate space for the horse’s health and wellbeing as well as allowing space to buffer odors and dust from the neighbors. Similarly, regulations on the number of horses that can be kept per acre, or required buffers between barns, manure piles, and other features of equestrian facilities and streams and property lines may be necessary to avoid conflict and protect surface water quality. Ordinances such as these help equine properties maintain good relationships with their neighbors and contribute to the environmental health of the community. 6. Enhance Public Awareness. Improving public awareness of the horses in the community can help make trail-sharing safer and more effective and can help develop support for policies protecting agricultural lands from development. In order for a community to be truly equestrian-friendly, the rest of the area must be aware of the role that horses play in the local economic and ecological reality. In some cases, this may be rather obvious, with little effort required to build support for the protection of the equine industry, while in others the benefits the equestrian community provides may be wholly unrecognized. Surveys can indicate the current level of public knowledge and support of horses in the community, and appropriate actions can be determined based on the results. 7. Incorporate Existing Facilities. Create equestrian zones around existing professional farms and equestrian neighborhoods in areas that already have large horse populations. Even in transportation planning, the locations of these facilities can help determine the type of roads necessary, or the most viable locations for equestrian-friendly trails. When planning for horse-related land uses, refer back to the survey of the local equine industry suggested in step 1. It makes little sense to plan for an equestrian neighborhood where there is currently a shopping mall, nor does it necessarily make sense to create a show facility on the opposite side of town from the professional barns. New facilities and neighborhoods are more likely to succeed when based on current patterns of horsekeeping, however the city or county also has a requirement to evaluate whether the current locations are the best ones for this type of land use. With the popularity of horse ownership continuing to grow, incorporating this segment of the community into planning efforts is becoming increasingly important. While not all of these steps will be appropriate for all communities, they do provide a buffet of options for the community planner to choose from in incorporating horses into the master plan. To truly serve the existing equestrian industry, efforts should also be made to reach out to local equestrian-oriented groups and non-profit organizations to gain their input on proposed plans or on areas in need of planning. Most national equestrian organizations, such as the United States Dressage Federation, 4-H, and United States Pony Club, have local chapters that can provide information on the equine industry and may provide a means for reaching out to the local equestrian community for suggestions. In addition, many non-profit organizations exist to encourage interfacing between the equestrian community and the planning community, including ELCR and Horses for Clean Water. Researching such organizations in your community will likely provide you the information you need to plan for your local equine industry effectively. ii 2012 USDA Census. http://www.agcensus.usda.gov/. iv A.A. Armstrong, J.P. Kayser, and J.G. Gardner. “The Beneficial Effects of Equine Events on the Local Economy,” Journal of Equine Veterinary Science 31 (2011): 230.